EUROZONE (AUS) (Chestnut 2010-Stud 2014). 4 wins-2 at 2-from 1100m to 1500m, A$476,080, ATC Stan Fox S., Gr.2, Rosebud H., L, Australian Turf Club 2YO H., Become an ATC Sponsor 2YO P., 2d MRC CF Orr S., Gr.1, 3d ATC Randwick Guineas, Gr.1, 4th VRC Australian Guineas, Gr.1. Half-brother to SW Miss Marielle (STC Hill S., Gr.2). Out of SW Miss Vandal (WATC Sires’ Produce S., Gr.3). His oldest progeny are yearlings. SO DELICIOUS, by Henny Hughes. 2 wins at 1350m, 1700m, 2d BRC Bundaberg Distilling Company H., 3d BRC Channel Seven H. Half-sister to HAPPY ARCHER, FEMINA FASHION. This is her first foal. HAPPY ARCHER (Dubawi). 7 wins-3 at 2-from 1000m to 2000m, R1,364,940, Greyville Thekwini S., Gr.1, Garden Province S., Gr.1, Gold Bracelet S., Gr.2, Clairwood Soccer 6 P., Turffontein Happy & Safe Easter P., 2d Clairwood Tibouchina S., Gr.2, Turffontein Starling S., Gr.3, Clairwood Lasertec Olivetti S., 3d Greyville Garden Province S., Gr.1, Turffontein Empress Club S., Gr.1-twice, Ipi Tombe Challenge, Gr.2, Clairwood DPG Logistics S., Protea Truck & Bus Parts P.
Fantastic Man. Winner at 1600m in 2016-17, 2d ATC Schweppes P.
So Delicious. 2 wins. See above. He's So Tempting. 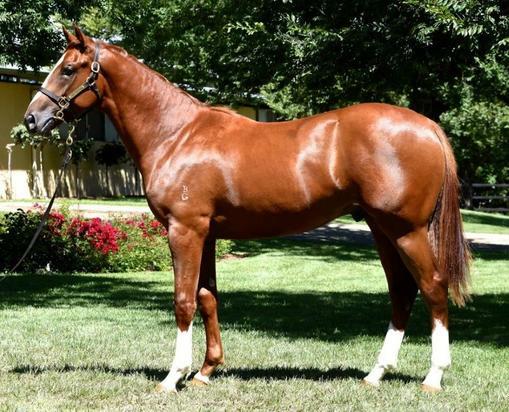 2 wins-1 at 2-at 1000m, 1650m, 2d Townsville TC Office Choice QTIS 600 2YO P.
Hard to Resist. Winner at 1200m in Aust. National Theatre - Nation Theatre (Sing.). 5 wins at 1600m, 1700m in Aust. and Singapore, Singapore TC Kranji D S.-twice, Class 4 H.-twice, 2d Singapore TC Kranji D S., Class 4 H., 3d Singapore TC Benchmark 83 H., Any Humour S., Benchmark 74 H., Benchmark 67 H., Class 4 H.
Single Barrel. Winner at 1300m in 2015-16, SAJC Quayclean P., 3d SAJC Moet & Chandon H.
BEREZNY (Bellotto). 3 wins at 1200m, 1450m, A$146,650, SAJC Adelaide Guineas, Gr.3, MRC Lawrence H., 2d VRC Scalzo Food Industries H., Dulcify H., MRC Manfred Welter H., VRC John Walker H., 3d MRC Vite Cheval H., MVRC Dominant Homecare Mile H., VATC Cambria 2YO H., 4th VRC Carbine Club S., Gr.3. Vivonne Bay. 8 wins from 1400m to 1600m, A$76,350, SAJC Nui Dat H., Oakbank RC Mistral H., 3d SAJC T&G Printing H., Top Cut H., KPMG H., SA Chamber Industries H.
Real Shanty. 6 wins from 1200m to 1800m, SAJC The Aristocrat H., Fraar H., 3d SAJC Vanellus Global H., Gapilo Food Company H., Umrum H.
So Tempted. Winner. See above. Padawan Star. Winner at 1600m in Aust. Oxford Don. Winner at 1200m in Aust. Lizana. 4 wins at 1050m, 1200m, SAJC Schweppes H., 3d SAJC Australia Day Races H.
Asian Odyssey. 4 wins from 1800m to 3100m, SAJC 3YO H.
Joetinsky. 3 wins from 1600m to 2400m, WATC Irwin H.